To maintain genome stability, cells need to replicate their DNA before dividing. 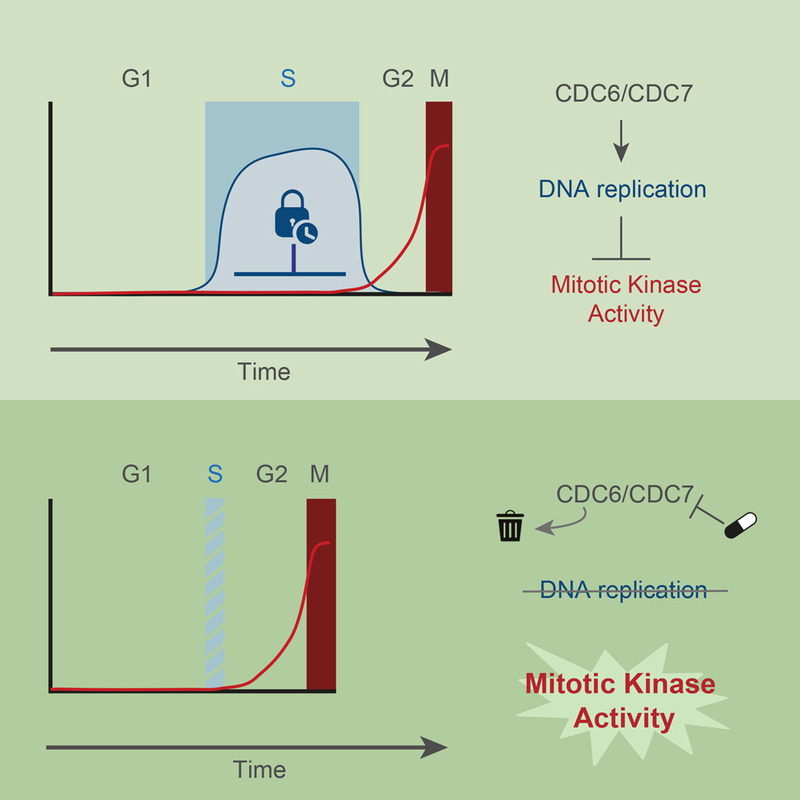 Upon completion of bulk DNA synthesis, the mitotic kinases CDK1 and PLK1 become active and drive entry into mitosis. Here, we have tested the hypothesis that DNA replication determines the timing of mitotic kinase activation. Using an optimized double-degron system, together with kinase inhibitors to enforce tight inhibition of key proteins, we find that human cells unable to initiate DNA replication prematurely enter mitosis. Preventing DNA replication licensing and/or firing causes prompt activation of CDK1 and PLK1 in S phase. In the presence of DNA replication, inhibition of CHK1 and p38 leads to premature activation of mitotic kinases, which induces severe replication stress. Our results demonstrate that, rather than merely a cell cycle output, DNA replication is an integral signaling component that restricts activation of mitotic kinases. DNA replication thus functions as a brake that determines cell cycle duration.